Nintendo has announced that you will be able to loot a Diablo III: Eternal Collection Nintendo Switch bundle next month. 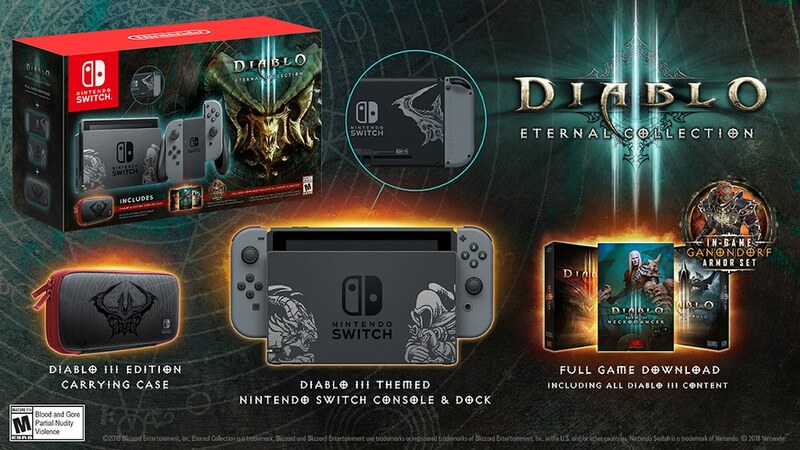 The Nintendo Switch Diablo III Limited Edition bundle ($359.99) comes with a Nintendo Switch console and dock that have been decorated with Diablo III artwork, a download code for Diablo III: Eternal Collection and a themed carrying case. For those that missed the news first time around, Diablo III: Eternal Collection has the complete classic game as well as the Rise of the Necromancer and Reaper of Souls expansions. There are additions exclusive to the portable home console version that come in The Legend of Ganondorf cosmetic armour set, Tri-Force portrait frame, Cucco companion pet and Echoes of the Mask cosmetic wings – which all take their inspiration from The Legend of Zelda series. The Nintendo Switch Diablo III Limited Edition bundle will release on the same date in Europe and North America, where it will be available exclusively at GameStop.